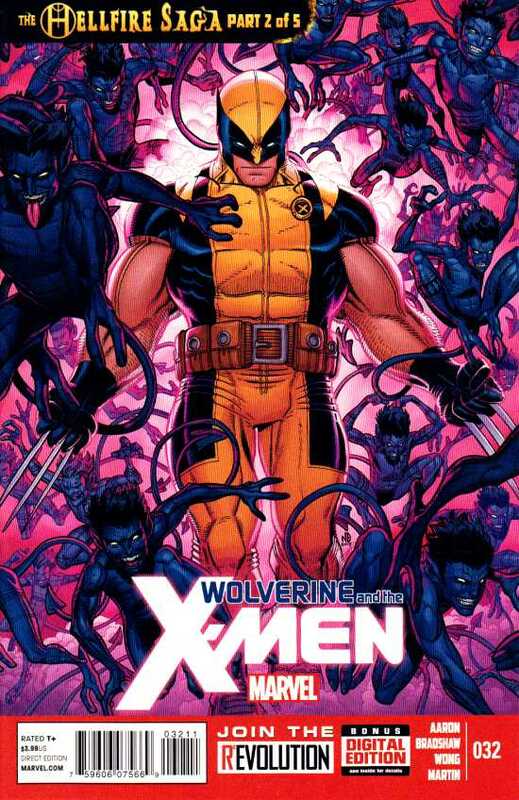 In the previous arc, Wolverine thought it would be a good idea to go to the Savage Land with some students – even though nothing good has ever happened to him there. 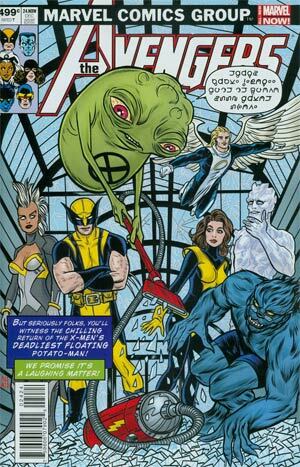 Glob Herman left the Jean Grey School to join the Hellfire Academy, as that is the next storyline in this issue. This is one of those rare (but beloved) downtime issues that we are not treated too nearly enough these days. In that storyline, Dog, James Howlett’s half brother, who turns out is a time traveling adventurer (as of course he is!) ran into his younger brother and beat him up pretty good. 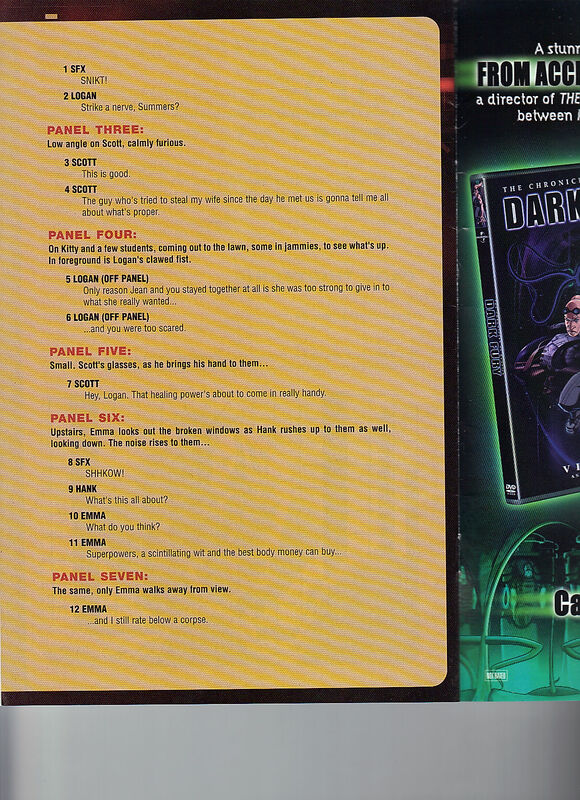 I didn’t get that many of these issues (parts one and three) so I didn’t follow it all that clearly. 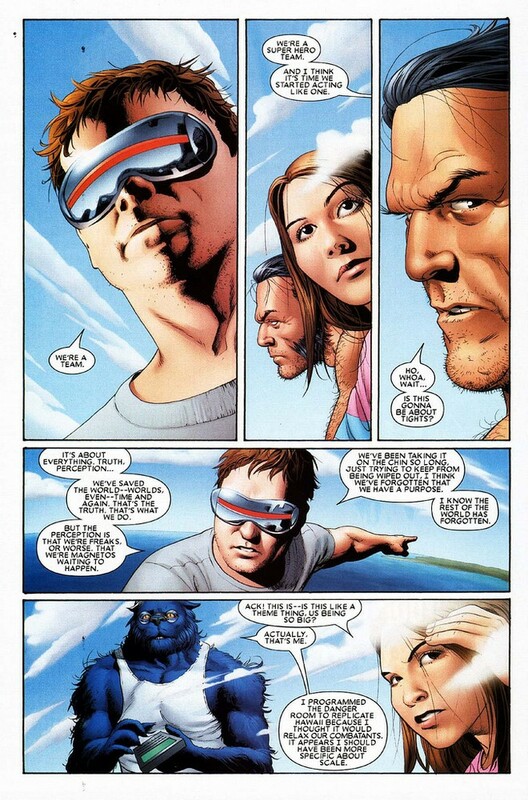 From this recap page, Logan was sent back in time at the request of Dog’s older self – so we got a bit of a Kang / Immortus situation there. Eye-boy, remember him? Barely? Yeah me too. Eye-boy realizes his potential to come and gathered the students and Jimmy James Howlett sent his older brother back to the future to be confronted by his same but much older half brother. Now. 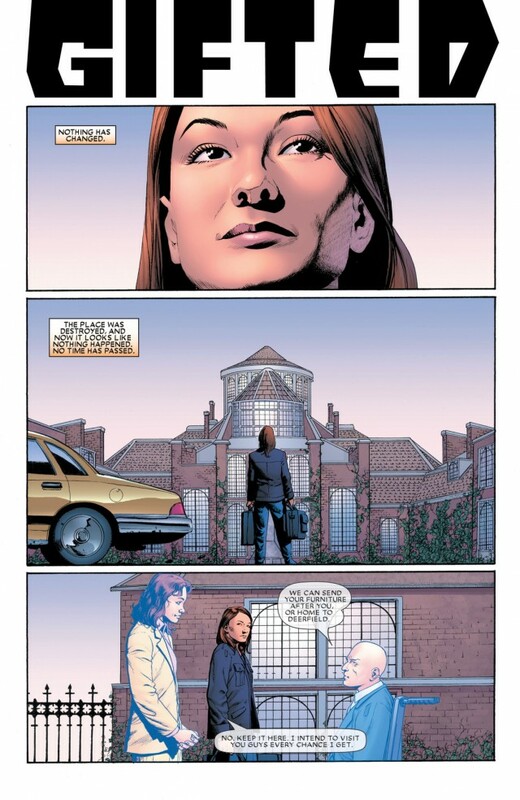 The Jean Grey School for Higher Learning. 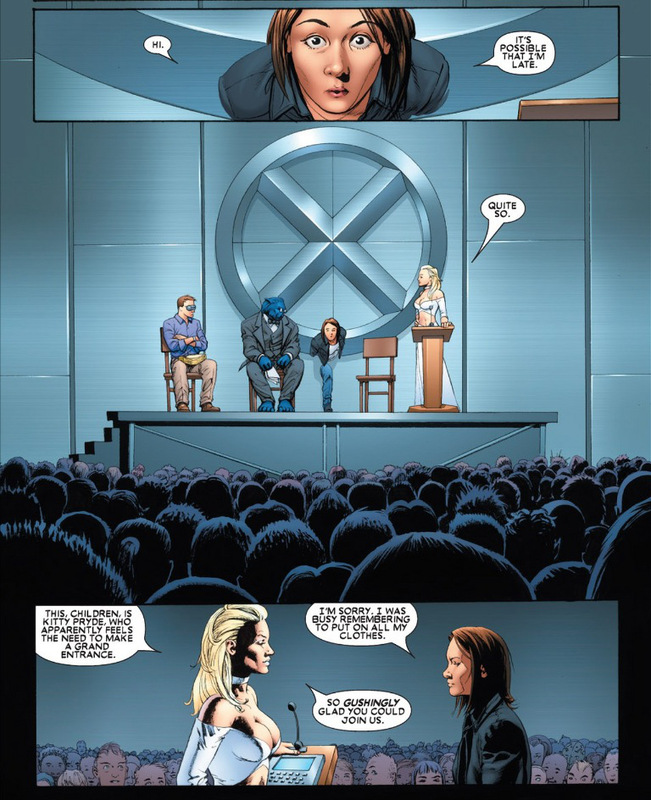 Most of the present scenes are made up of Logan giving a speech. It isn’t graduation day but more of a ‘back on track’ sort of speech. 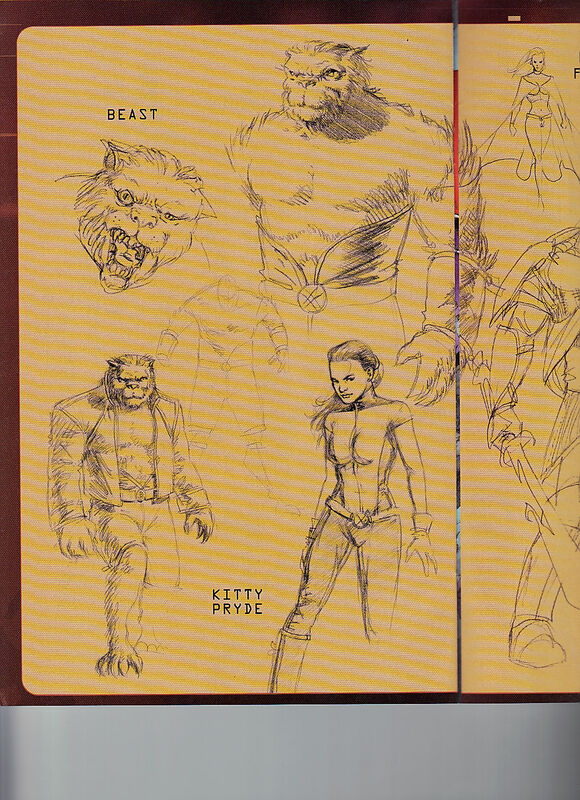 Kitty and Lockheed made it, as did most mutants who were appearing in a comic at the time. Earlier. The Canadian Rockies. Wolverine and Beast are looking for Dog’s trail. 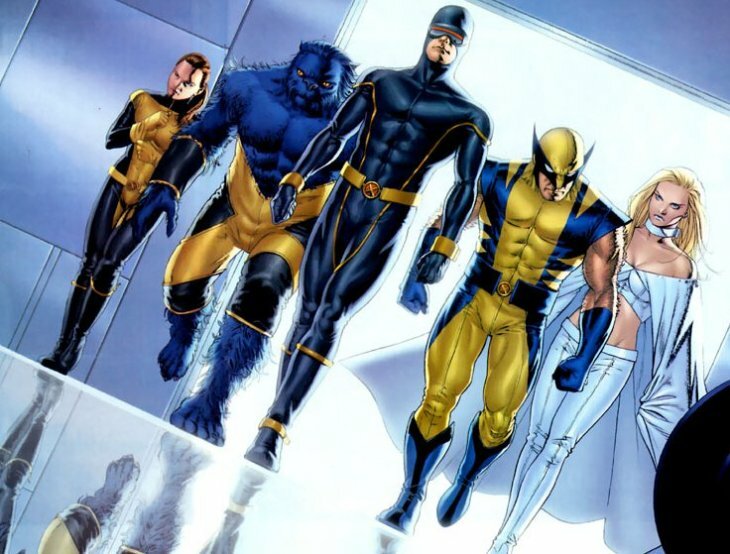 Wolverine doesn’t want to be called “Logan,” as it is a fake name that he has grown to not like the origins of his name, as it the groundkeeper, Thomas Logan’s name, who is his actual father. Wolverine is giving a bit of a motivation slash mission statement speech to the assembled school. Earlier. 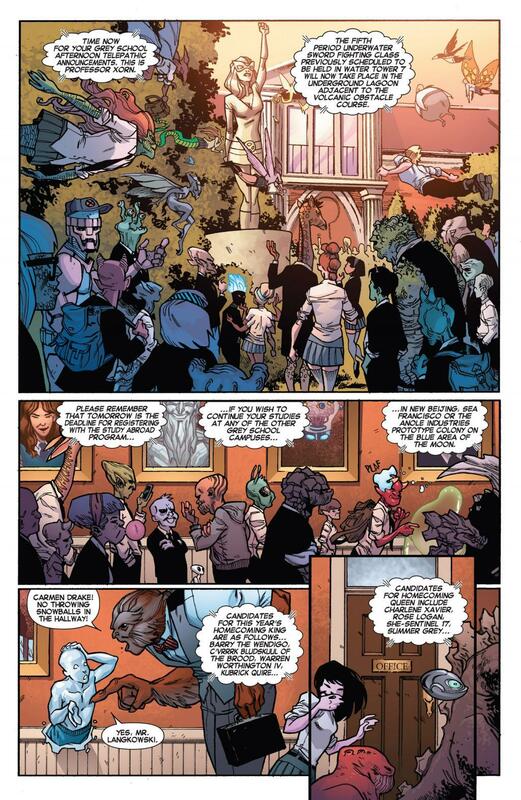 The Jean Grey School, Basement Level C. Beast is looking over the items they did find in Dog Logan’s cabin. They found a small box that they can’t seem to open – this will make up the backbone of the plot for the issue. Iron Man 3 is on its way to theaters and there are several products to tie-in to the film. Beast has tried several different ways to get the box opened. Even Kitty tried to help but she couldn’t phase through it. The box must have future origins. Beast wants to know why Wolverine never told anyone about his half brother. I guess there really wasn’t time to do so, after House of M. That was when he got all of his memories, but I imagine he had drinks with Kurt, once, and probably told him then. 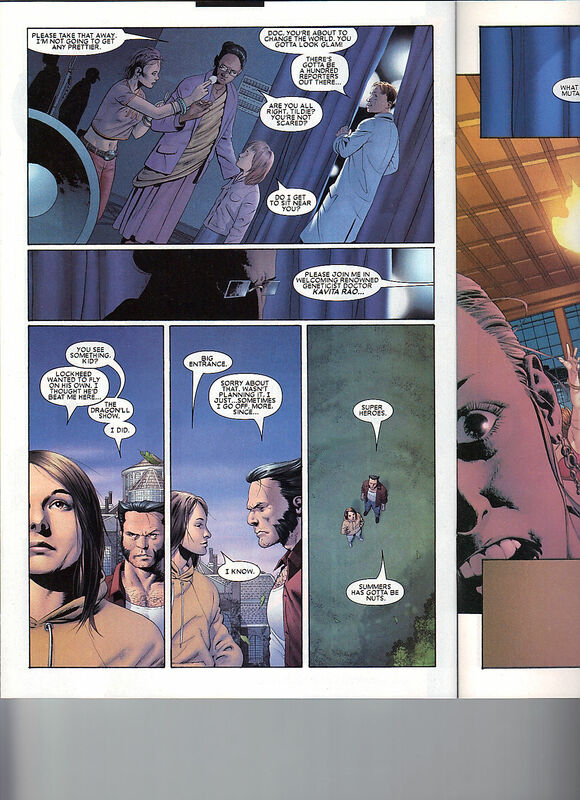 House of M was in 2010 so a lot happened between then and now (with this issue) including Schism that launched this title 28 issues earlier. 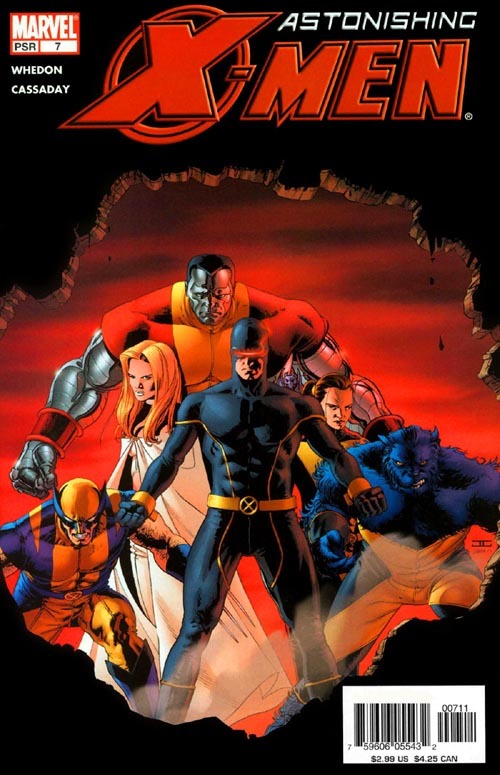 Avengers vs X-Men happened and Battle of the Atom is being talked about at X-Men retreats. Most likely. 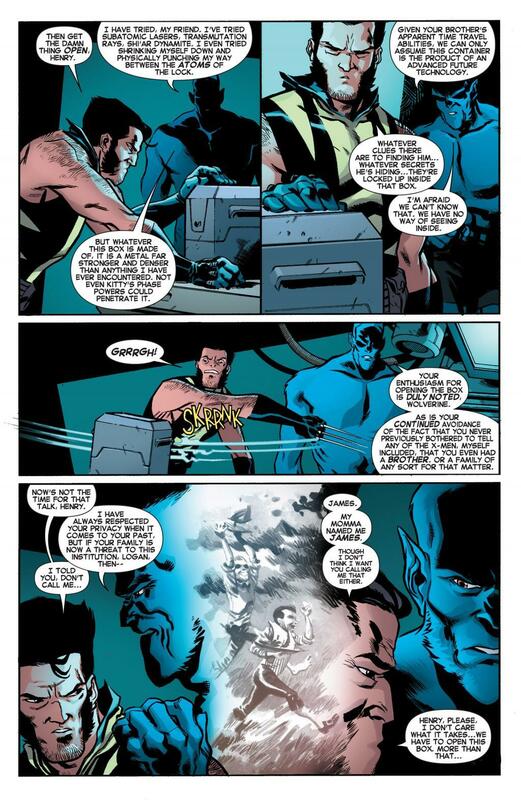 Wolverine tells Beast that his real name is James. Beast takes the news well. This speech of Wolveirne’s is leading up to burying a time capsule. Something that always appears to happen in works of fiction but I never heard of anyone doing it in real life. Professor W tells everyone to go to class. Kitty applauds as he has come a long way from barely speaking three words to her during their first six months of knowing each other. 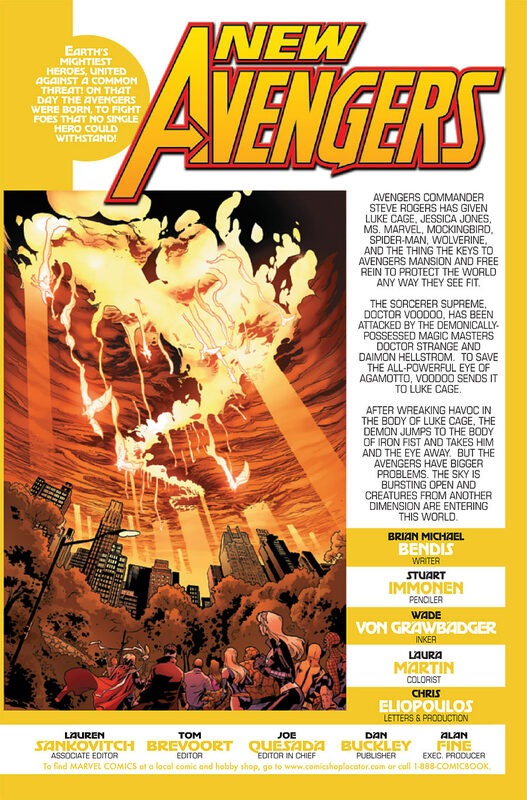 He was going through a lot, back then, having to deal with the death of the Phoenix Force and all that. Wolverine tells Toad, the current janitor, that he can dig his own holes. I like that he takes the time to apologize for digging into Krakoa. 25 Years Later. Old Man Logan, but not that one, but does have that look, sort of – and the bamfs are digging up the time capsule. A passing of time that could only happen like this, in a comic book. 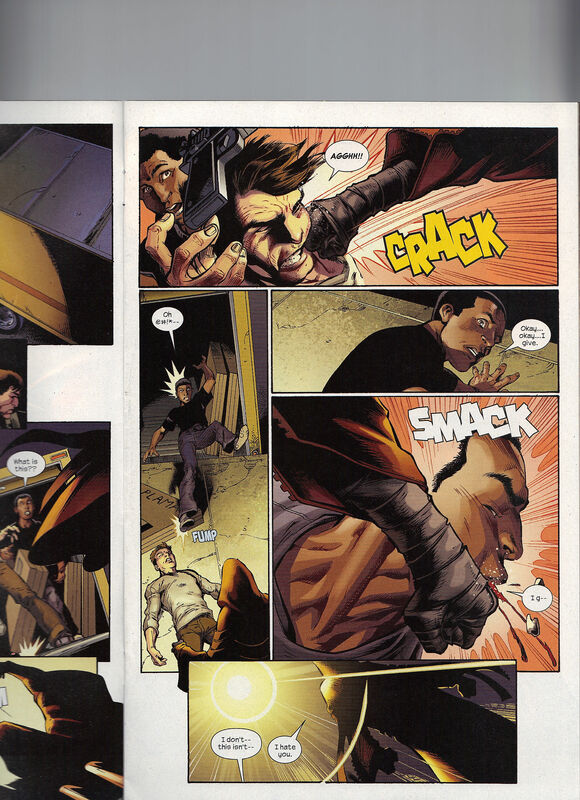 An American superhero comic. Millar / McNiven’s Old Man Logan came out in 2009 so the look has to be intentional. Over the telepathic intercom, Professor Xorn gives an update of today’s agenda. Along the walls of the school, we get who I imagine must be Kate Pryde in this timeline. I like how Iceman has a beard, well two at this point – which will be hinted at later – one of them during Battle of the Atom. Sasquatch, or Mr. Langkowski if you’re nasty – tells Carmen Drake to stop throwing snowballs in the hall. Of course he would be named after Kitty’s father as Bobby’s father is a jerk. Young Carmen has both of his parents’ powers – he can phase and he can create ice. This character should show up more as he has a lot of potential. I like how there is eventually a Warren Worthington IV and a Summer Grey as why not at that point. Old Professor Man Logan and the Bamfs are looking over the time capsule. He tries to place when the capsule was buried. He gets the Savage Land adventure right. In a floating Sentinel head, in space, Eye Man watches over the world, looking for trouble and making it double. Eye Man is 40 now. OPML is looking for some time travel gear but Eye Man keeps trying to get him to not use any of that technology. It never works out well for the X-Men. Old Logan wants to send Younger Logan something to warn him of the future days that lay ahead. 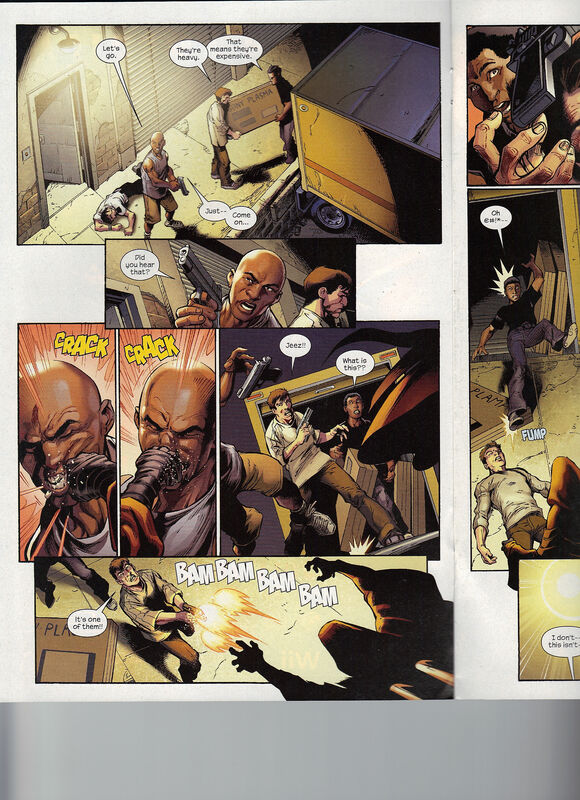 Eye Man goes to Earth to help out a mission and Old Logan finds what he was looking for. Present Day. Wolverine is digging the hole and finds another item. It is the key taped to a letter from his older self. There is a full page house ad for the upcoming Hellfire Saga, that starts next issue – we’ve reviewed a few of them and will do the whole thing, one of these days. That ad perfectly transitions us to Dog Logan punching his future self out, he doesn’t stop there and kills his older self. Which why his older self would send his younger self on this mission, in the first place, is beyond me. Kade Kilgore, and his assistant, The Philistine, offer Dog Logan a teaching position. Wolverine opens the box and finds a sail boat – which is nice. Epilogue. Oya ties Broo (who is essentially an animal here as he was shot in the head in an earlier issue) to a base of a fallen X-Man’s statue. Which I liked that touch, we never got to see them enough. 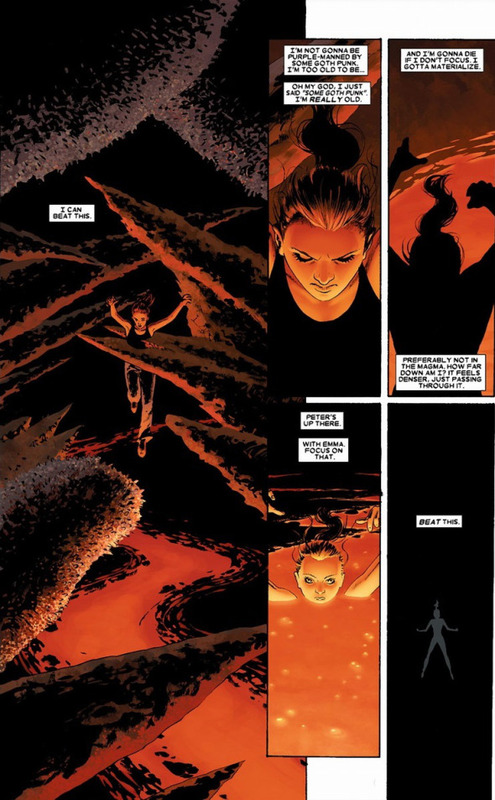 The issue ends with Oya, crying, as she joins the Hellfire Academy. She’s going to work it from the inside. 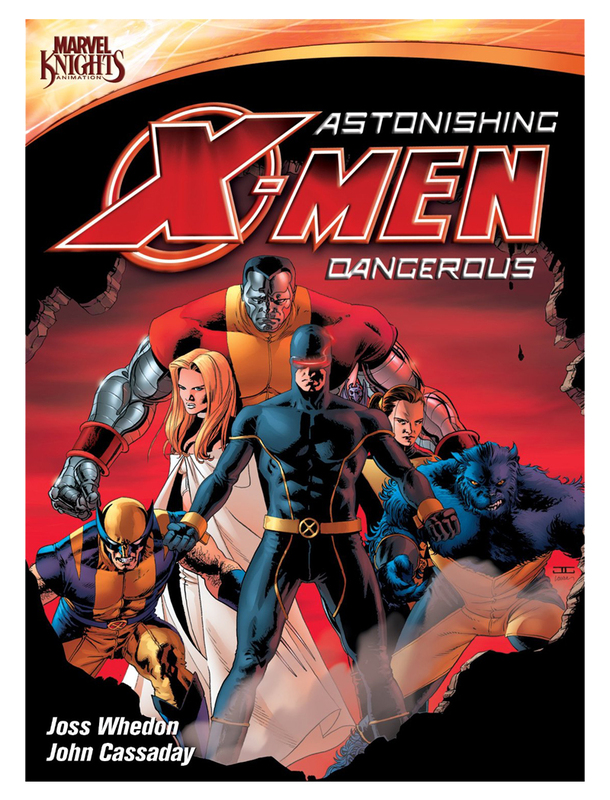 A+X 8 – Captain America + Wolverine! Hawkeye + Deadpool! 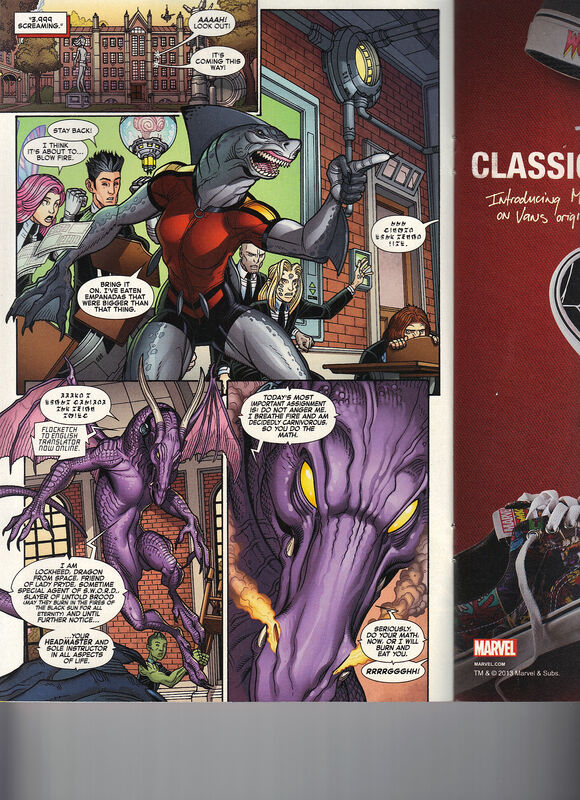 My issue eight is Spider-Woman + Kitty Pryde with Lockheed. 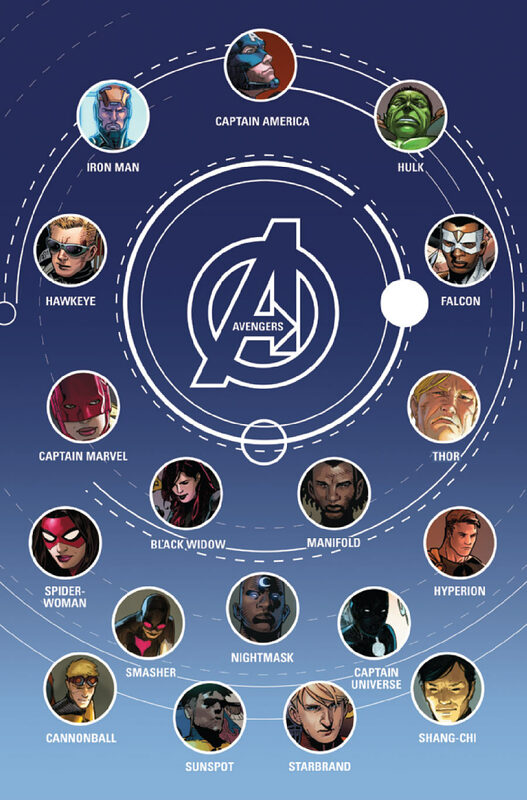 Cap & Wolverine get issue nine but this issue does have Hawkeye and Deadpool. 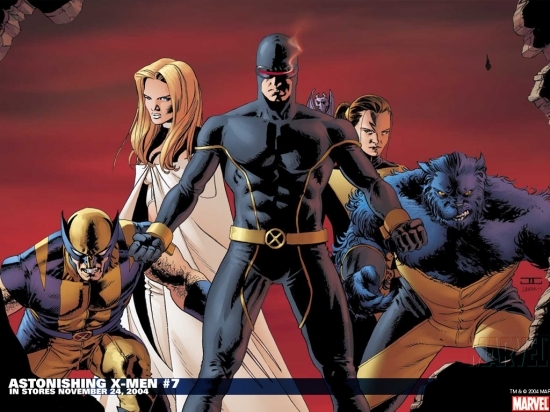 All New X-Men 11 – Which member of the original X-Men is leaving the team to join the Uncanny X-Men? 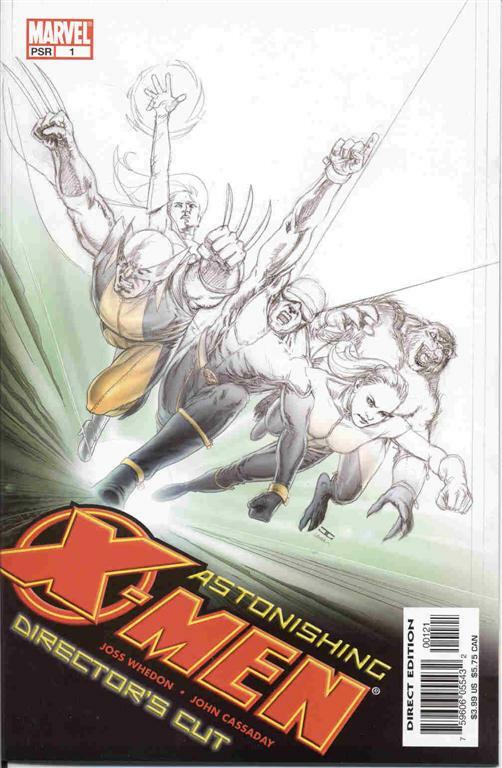 Astonishing X-Men 62 – In the aftermath of X-Termination, Iceman faces his worst enemy: himself! 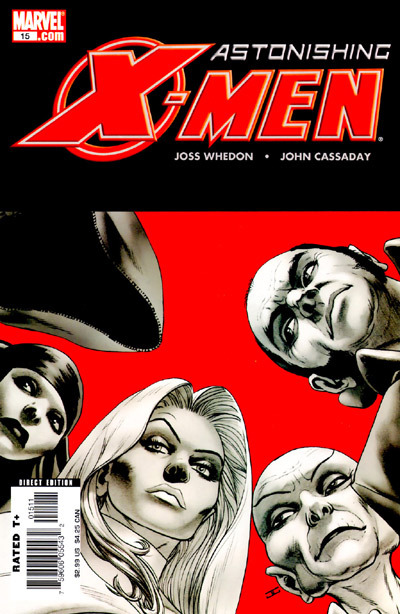 Uncanny X-Men 6 – Lost in Limbo. 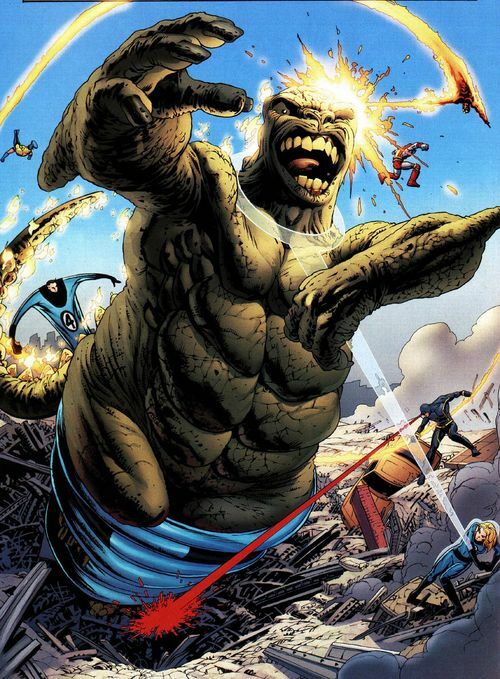 Set upon by the dread Dormammu and his mindless ones! 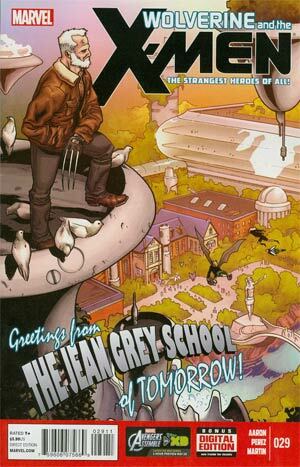 Wolverine and the X-Men 29 & 30 – First: The Future of the Jean Grey School! Then: How far will Beast go to save young Broo? 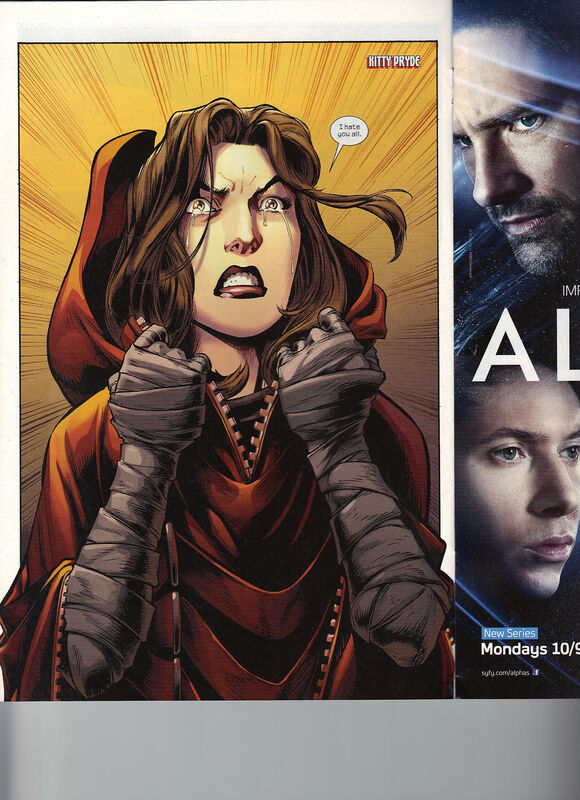 X-Men 1 – An all-new series from Brian Wood and Olivier Coipel, starring the women of the X-Men! X-Men Legacy 10 & 11 – Legion tracks down an anti-mutant activist — but is he really who he claims to be? I can’t recall if this is the beginning of double shipping, the middle of it or the ending of it but those are a lot of comics for one month. I own so many of these, for once! Walker Dennis is three years old today! This may be my last of my Pryde’s Pride issues, unless I can buy that variant cover to Wolverine and the X-Men 25 and Marvel Zombies Halloween Special – if not, I’ll just have to do a back issue post or something to celebrate my little mijo’s birthday on this blog. Corporate Headquaters of Kilgore Arms. Midtown Manhattan. Kitty and Iceman have broke into the place. 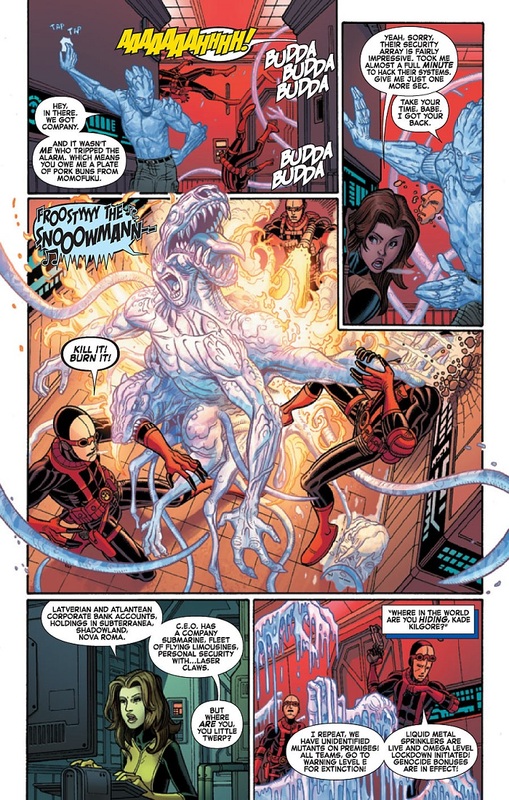 Iceman created the creature from The Thing. 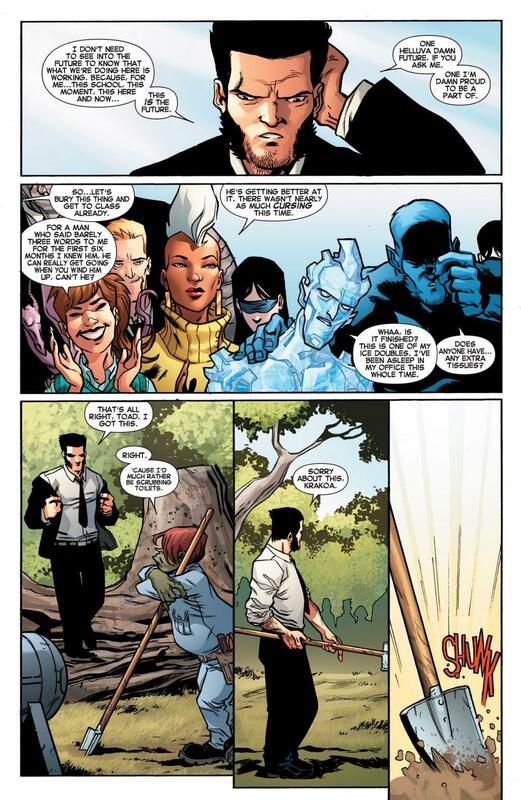 Iceman points out that Kitty was the one that tripped the alarm. 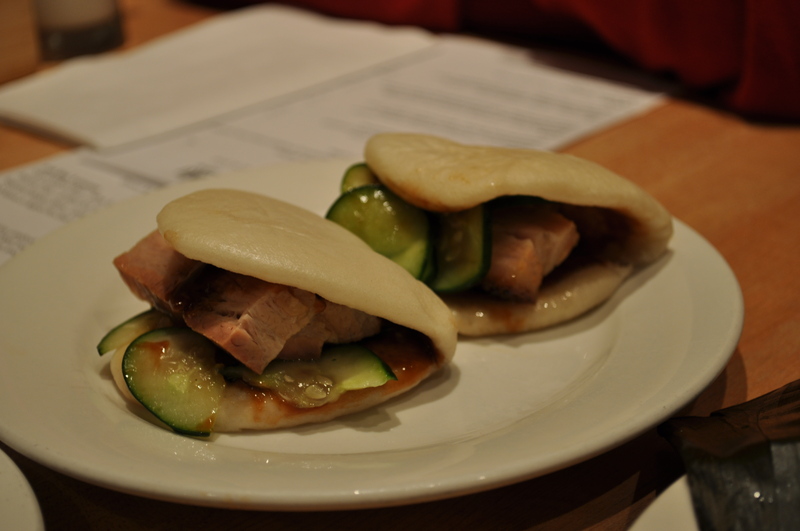 Now Kitty owes him a plate of pork buns from Momofuku. Kitty states that the security was impressive, it almost took her a full minute to hack into it. They cannot locate Kilgore. 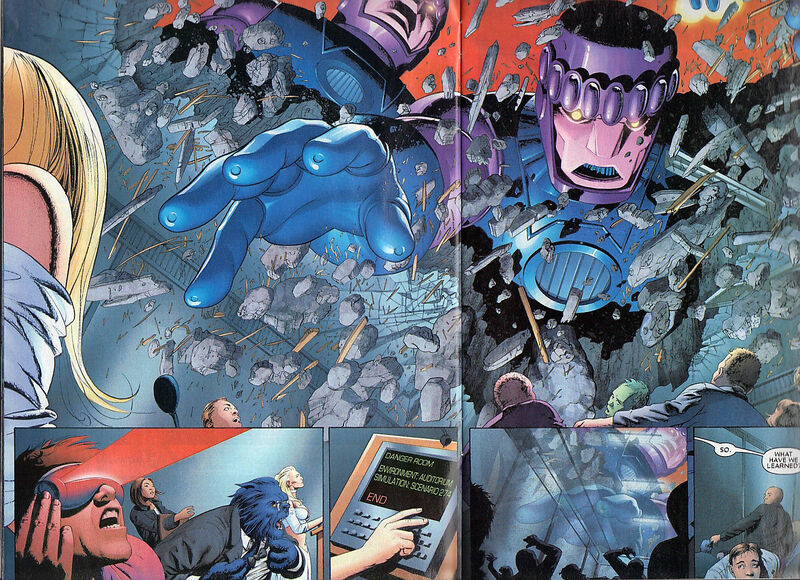 To make this not a complete bust, Iceman destroys the top fifty floors of the building! People probably were not in it. Chaparanga Beach, Indoesia. Doop and Warbird are at a spaceship graveyard, looking for clues. Somewhere Above the Atlantic Ocean. Beast is determine to locate this 12 year old who is harassing him so much. Angel isn’t thrilled that he didn’t get to the newly located heroes in time. Storm is with her, just nagging at Rachel and stopping all progress. 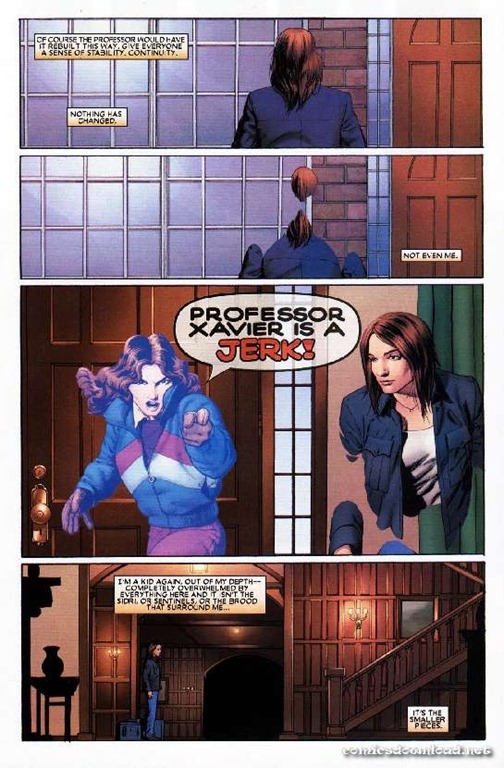 Jean Grey School for Higher Learning. I love Bradshaw’s Lockheed, he looks awesome! Also, Aaron writes him as great as I would say Kieron Gillen. That’s right folks, I’m apparently keeping track of people who write Lockheed well. 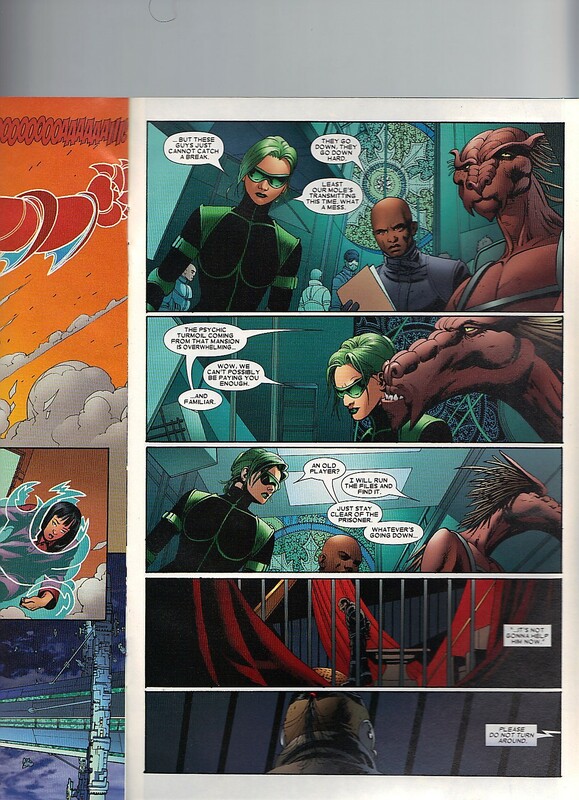 So jarrod from the Comic Book Resources’ X-Books thread keeps referring to Lockheed as Headmaster Lockheed and like a good fellow poster – I just go with it, not really knowing or getting the reference. But liking the idea of Lockheed running a school. Then I finally own this issue thanks to MileHighComics.com and my wife getting me the gift of comics for Father’s Day and now I totally get the reference. This Lockheed is a Lockheed that deserves to rule er, I mean, run a school. He’s totally bad arse and in charge. Lockheed was given a collar that translate his words to English. He’s a dragon from space. 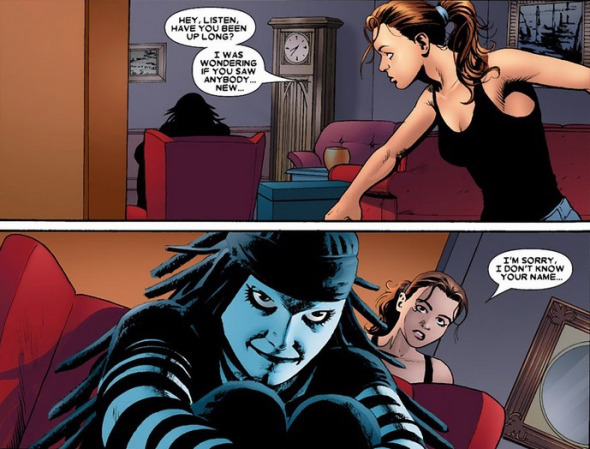 Friend of Lady Pryde. Sometime special agent of SWORD. Slayer of untold brood – may they burn in the fires of the black sun for all eternity. He’s also the working headmaster and sole instructor in all aspects of life. If I read this comic within the last two years, I would have been clamoring for an Arron / Bradhsaw Lockheed ongoing or at least miniseries. I may just start doing that, regardless! Today’s assignment? Do not anger Lockheed. He breathes fire and is carnivorous. So do the math, seriously do your math! Such fun and great dialogue! 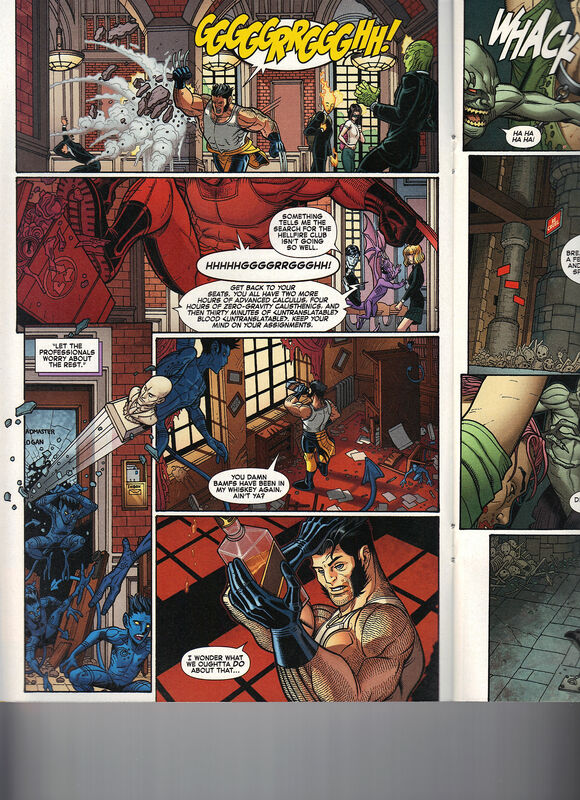 Wolverine is going around just slashing the walls. He sees that the Bamfs like his whiskey and starts forming a plan. Meanwhile, at the Hellfire Academy. 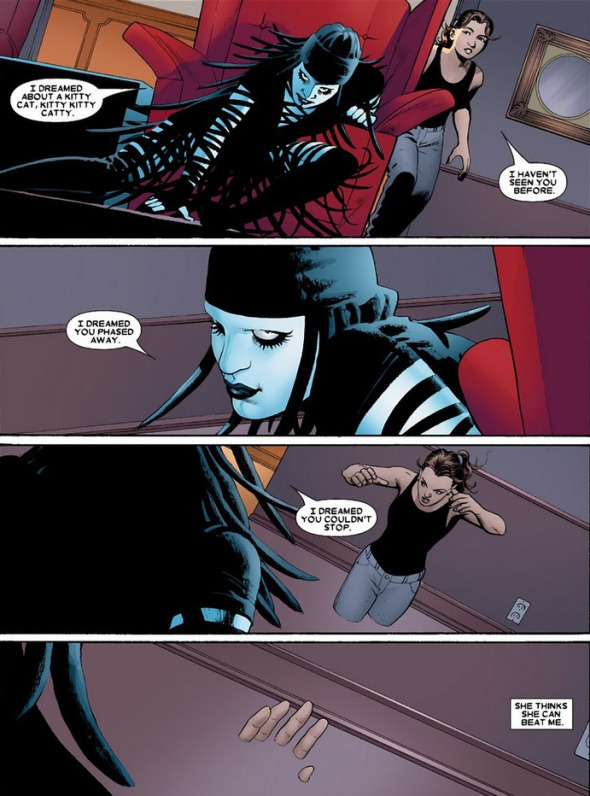 Master Pandemonium is torturing Quentin Quire. Philistine comes in to relief the other villain, who has demons for hands. That has to be awkward. We get Philistine’s origin. He’s really into the Siege Perilous. The Teacher’s Lounge. 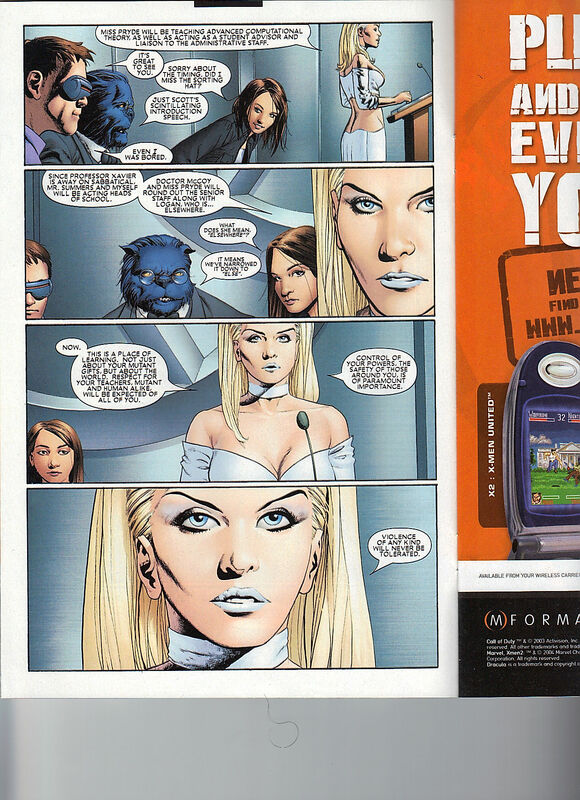 Mystique is trying to get an update from everyone. Sauron is there, Dog Logan, a lady Mojo, the space alien who likes to collect Broods. Toad thinks they should let the captured Jean Grey students go, so they can maybe lead regular lives. This embarrasses Husk. Wolverine has made a deal, the Bamfs can drink his whiskey but they have to take him along the trail the Hellfire Academy left behind. Sabretooth and Kilgore are talking. Sabretooth is being paid very handsomely. Kilgore wants him to be the Headmaster. Lord Deathsike is also a member of the teaching staff. 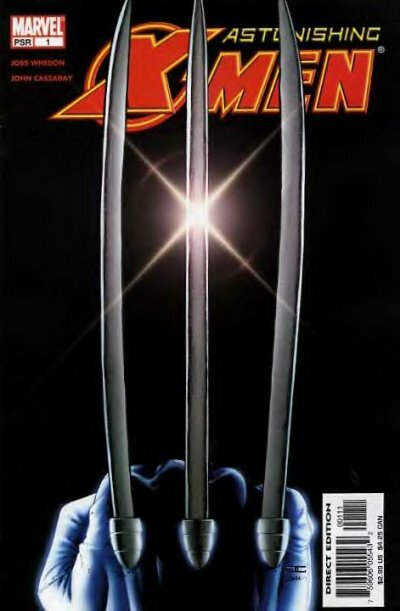 Issue ends as Wolverine and the Bamfs have located Lord Deathstrike, so Wolverine is getting closer! I own all of these minus issues four and five. 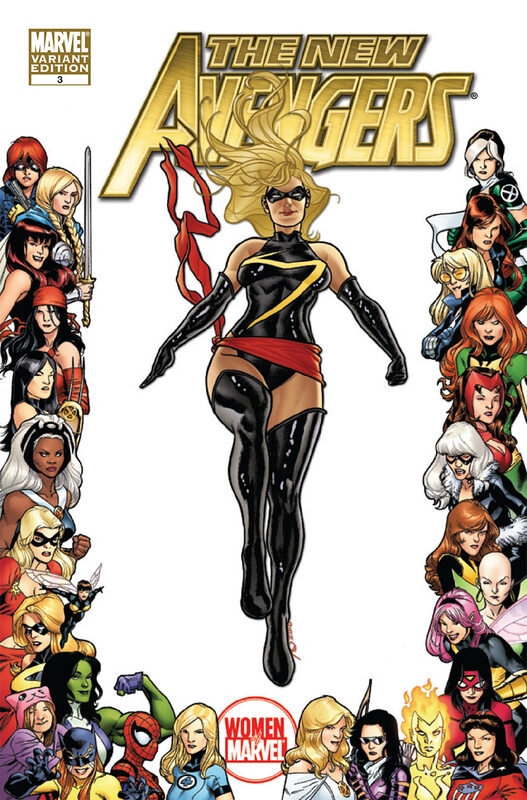 Issue six’s variant cover is on my Wishlist as it is the X-Men portion of the poster. 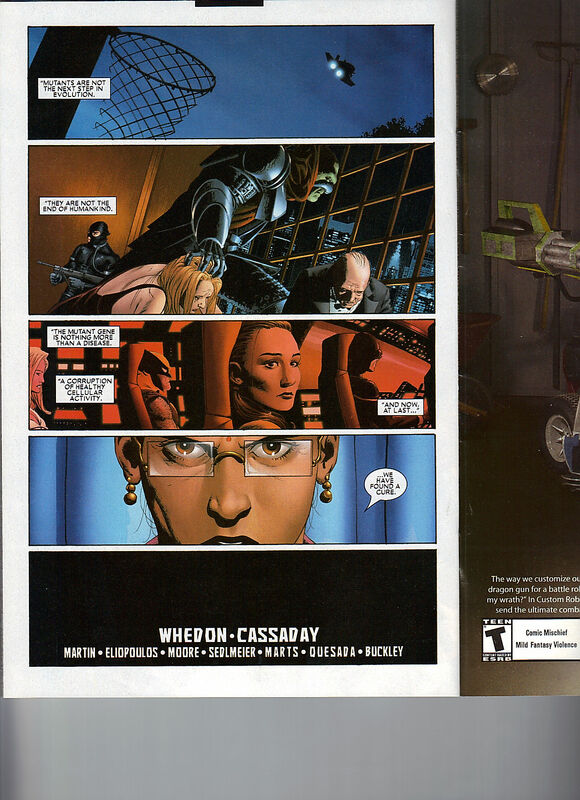 Inside front cover ad is a Ryan Reynolds’ Green Lantern Got Milk ad. 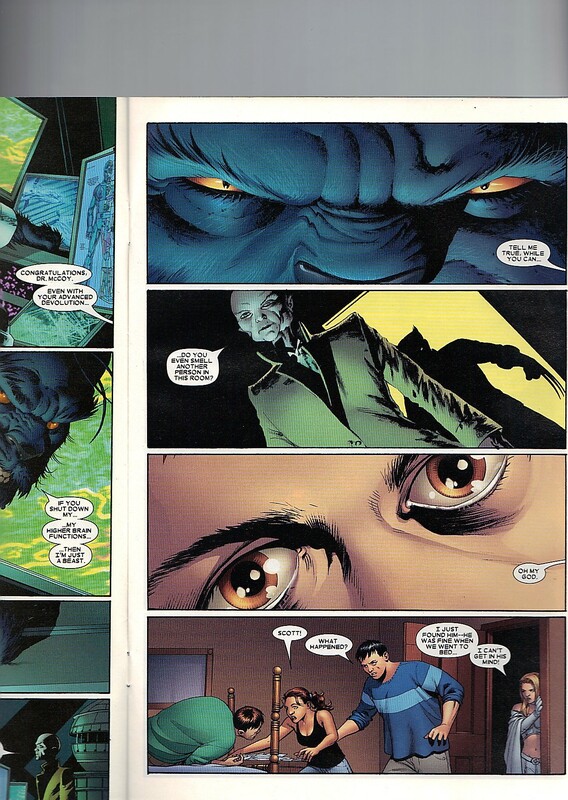 Peter Parker died in Ultimate Spider-Man 155 at the hands of Norman Osborn, Green Goblin. 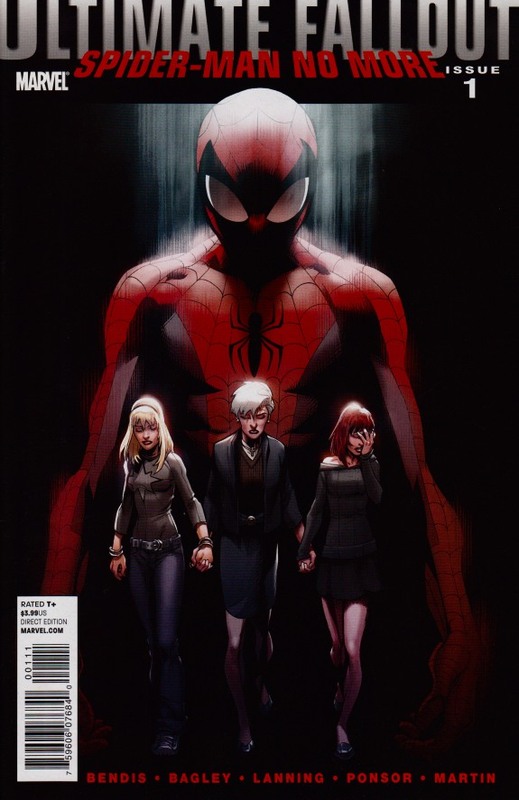 I own that issue and issue 150, which is so great as it is Peter’s last good day before the Death of Spider-Man storyline began. On the credit page, it takes states Peter died in the arms of his one true love – Mary Jane. Which has to hurt Kitty’s feelings, as I like to think there is at least a debate of who is his true love. 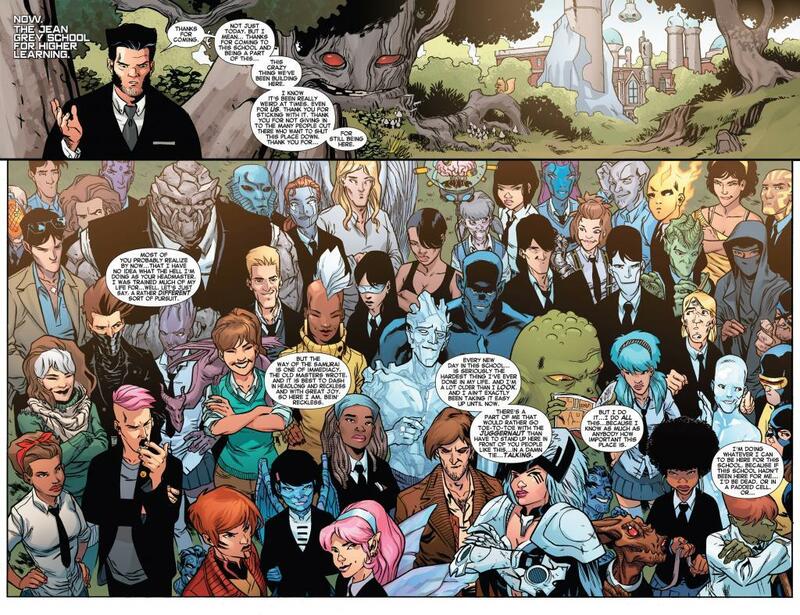 Issue opens up various people’s reactions to Peter’s death. 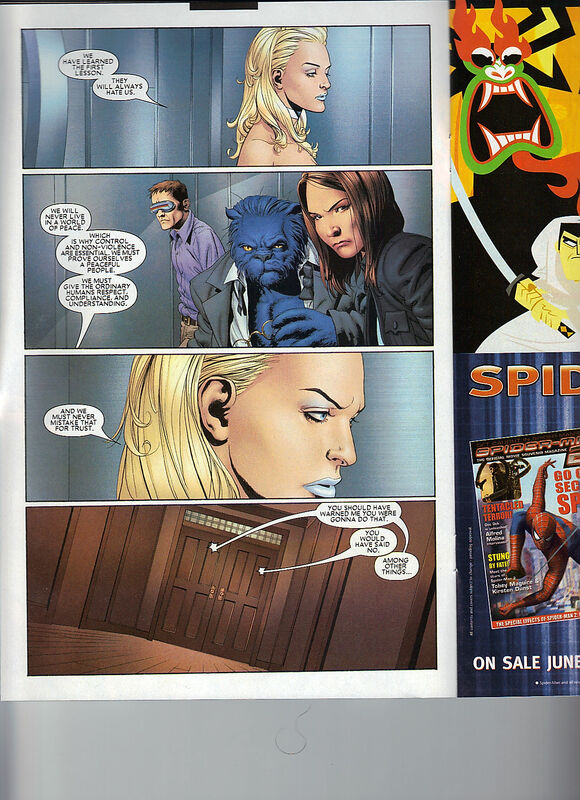 I like how the image from the newspaper is the cover from Ultimate Spider-Man issue one. Gwen feels she is cursed. J. Jonah Jameson is trying to write an article on Peter but can’t get the first sentence completed. Humam Torch, still a brunette, goes super nova on top of the Empire State Building. 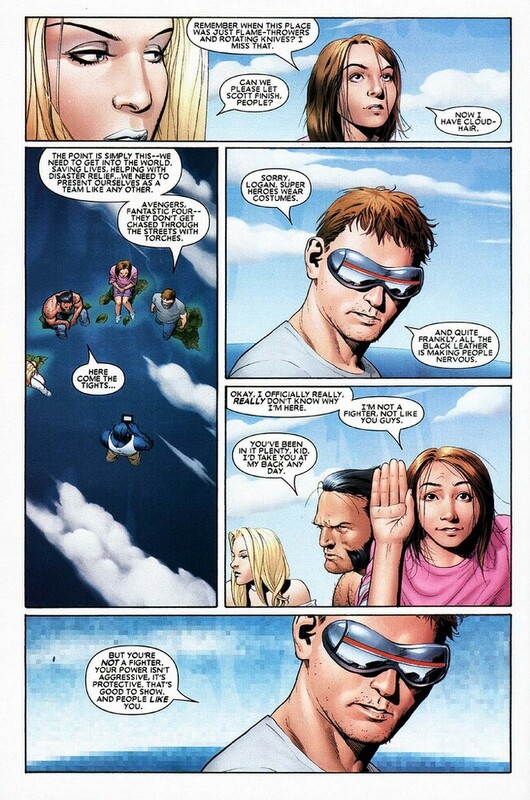 These three pages are why I bought the issue. I really liked Kitty as Ultimate Shroud, the best use of Shroud, there ever has been, since the 90s. 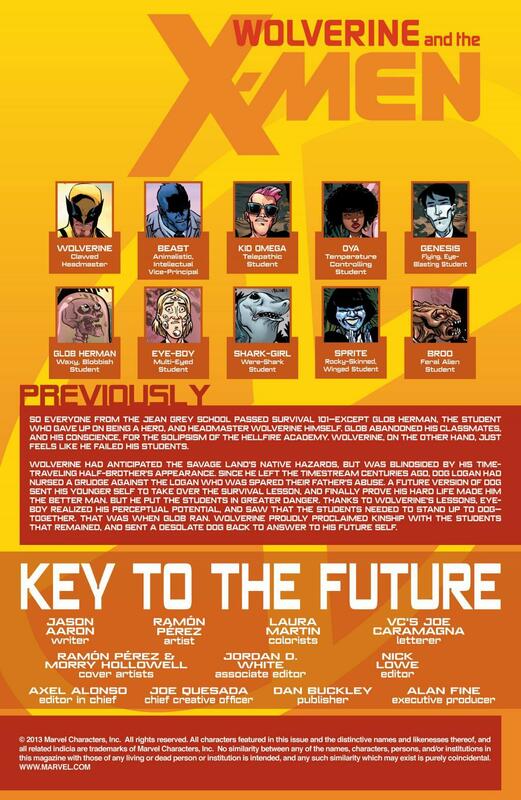 Flash Thompson is the only student in the classroom. Mary Jane is spying on SHIELD on the Queensboro bridge. Captain America’s first film is coming out soon, as he is being used to promote gum and contests. 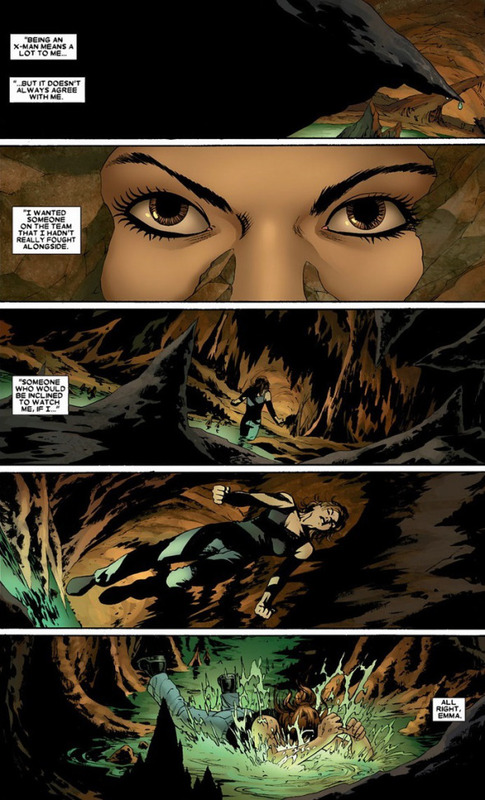 Mary Jane is caught, Fury lets her go with a warning. 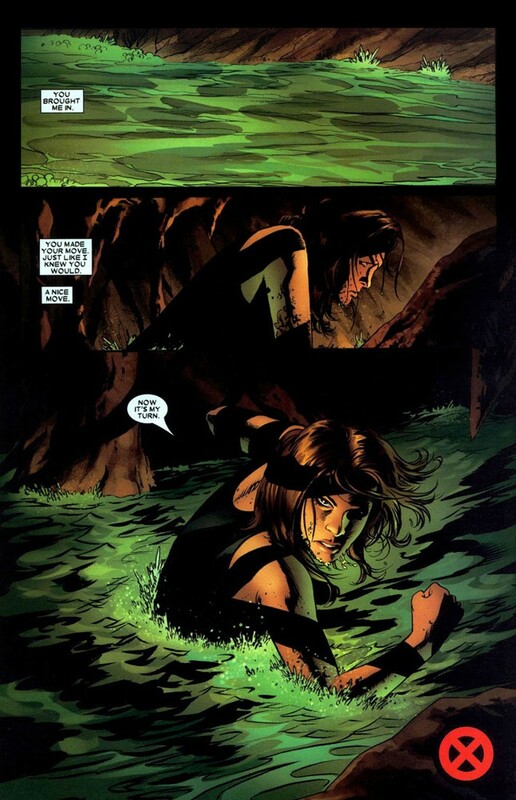 She wants to prove that Fury and SHIELD are responsible for Peter’s death. Tony Stark is on his way to Peter’s funeral in a limo with Aunt May and Gwen. He is going to pay for the funeral and anything else. I love the shot of the church, with what has to be thousands out to remember Peter. There is a great moment with Aunt May and a little girl who Peter saved from a fire. That hug, made me want to cry. I swear, having a baby has my emotions all over the place. 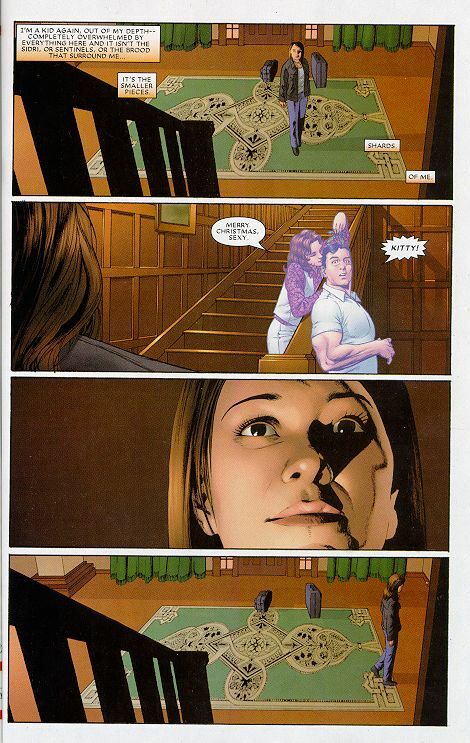 Inside the church, Captain America in his military uniform and ge tells her he is responsible for Peter’s death. Which ends the issue.